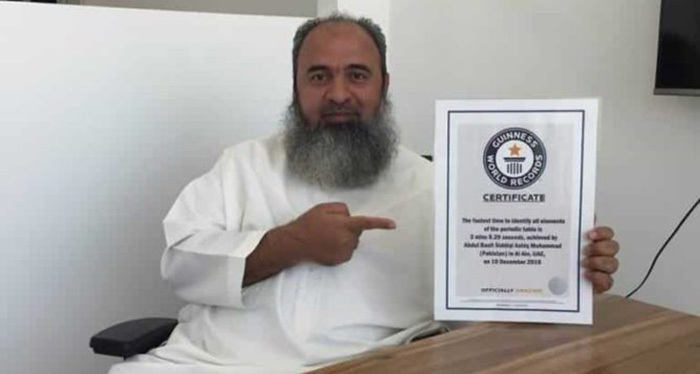 Fastest Texter Guinness World Record 2017 Update: A Pakistani mental-genius Abdul Basit has set a new world record by setting the Fastest Texter Guinness World Record 2017. Besides this Abdul Basit also got the Guinnes World Recrod of fastest time to identify all the elements in the periodic table. A memory-genius and a very humble person by nature, Abdul Basit currently resides in Dubai. He holds a B.A. degree from Bahauddin Zakaria University, Multan, and is an MBA (MIS) from IBA, Karachi. He is married, has three kids, and earns his living as a mental-calculations and memory trainer at an American institute. Abul Basit told ProPakistani, back when he attempted his first record. In December 2016, Abdul Basit achieved his first Guinness World Record — he managed to identify all the elements of the periodic table in 3 minutes and 9.29 seconds. True to his word, he has managed to score another world record, recognized by the renowned Guinness World Records. Yes, texting may be the main form of communication for millennials, but this respectable gentleman has beaten them in their own game. He is now officially the Fastest Texter Guinness World Record 2017 fastest person to type a text message on a mobile phone using Swype technology. If you don’t know what Swype is, its an onscreen keyboard app that lets you type on a touch keyboard using gestures — gliding your finger across the screen from one letter to another to make up a word. Just like last time, his main motivation for attempting the record was, like it says on the record’s page, to inspire his students. When asked about how he practiced for the event, he said that he doesn’t get much time due to his tough teaching schedule. Usually, he spent just 15 minutes on a daily basis to practice for the record. That time also includes the few seconds he managed to utilize every time his car was at a red signal. Video Credit: Click HereThe Fastest Texter Guinness World Record 2017 was attempted on the 22nd of May 2017 in private settings in an office with four cameras to capture the event. Two official timekeepers and two judges were also present to ensure the fairness of the attempt. To achieve the record, Abdul Basit had to type out the required text and hold up the mobile at full arm’s length once he was done. Abdul Basit is determined to continue breaking records. His next goal is to memorize the most decimal places of Euler’s number, an irrational number that is considered to be very important in the field of Mathematics. i wan ma know how the heck he had swipe on an iphone. lol. that doesn’t make any damn sense. weirddddddd.